As we discussed earlier about bus routing, more than half a million school buses operate in the United States. Bus scheduling depends on the routes chosen to pick up and drop off children. Sometimes what you believe would be the quickest route to pick up and drop off your child is not the safest route for all school bus passengers. 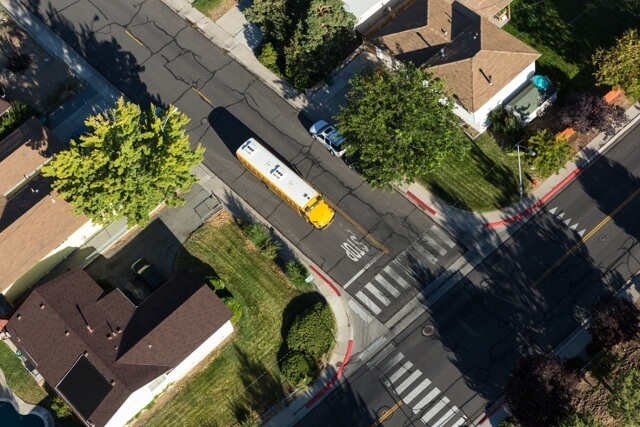 Street mapping and route conditions are just two of the factors to consider when creating a route and planning the corresponding bus scheduling. Geography and current conditions: Hills, slopes, large trees, large shrubs adjacent to sidewalks, and even time of day can prove to be line-of-sight impediments for a school bus route. If the sun rises or sets directly along the route, and the route is in use during those times, the driver's ability to clearly see the road at all times could be an important safety consideration. Other seasonal issues include placement of snow drifts by snow plows that could block the vision of the bus driver. Timing: Heavy route use impacts bus scheduling. A slightly longer route that avoids congested streets could ultimately prove a safer and quicker route. To understand potential routes and how they impact bus scheduling, use a walkability checklist to assess what your children experience as they head to or from school. Consider offering your findings to your local school or community officials if you discover conditions that you feel should be improved. Always use sidewalks: If sidewalks are unavailable, your child should walk facing oncoming traffic and as far off the road as possible. Be seen: Wear reflective bright clothing. If your child is heading to the bus stop, or waiting in the wee dawn hours, it’s advisable to secure reflective strips on their clothing and backpack. Consider inexpensive flashing wristbands to help your child be seen in the dark. Be aware: Encourage your child to walk with friends, look both ways before crossing the street, keep earbuds out and eyes up during a walking or biking commute, and not to engage in horseplay by the roadside. Bus scheduling and routing is an important aspect of keeping your child safe – and so is SafeStop. If you have questions about how SafeStop can help keep your school community safe, contact us today.